Our team motto is “Together We Are Stronger” and it couldn’t be more fitting as it resonates the true spirit of Jiu-Jitsu. When training Jiu-Jitsu, you will quickly develop lifelong friendships. Everyone is going to have good and bad days on the mat and with a solid team behind you, your bad days will turn into some of your greatest ones. Our motto creates a fantastic community within our academy! We are moving to a new location at 256 Dundurn St. S on May 1st and I am really excited because I know that we are moving into such a fantastic community! This is an extremely vibrant and close-knit community and I can’t wait to be part of it! We are one block away from a lot of great businesses on Locke Street. We are also much closer to McMaster University so I know it will be a lot easier for students to make their way to our academy for some fun stress relief! Our motto “Together We Are Stronger” also reiterates the importance of a having a great team! Although, many people might feel that BJJ is an individual sport because there is only one person stepping onto the mat to compete, it takes an ENTIRE TEAM to prepare and support that individual. Our team focuses on raising each other up rather than knocking each other down and we consistently work on troubleshooting positions and techniques to make each person better given their specific style and skillset. Jiu-Jitsu really is for everyone! A great team has great leaders. The Atos Jiu Jitsu team was founded in 2008 by Professors Andre Galvao and Ramon Lemos. Immediately, the team made an impact on the international scene. They had a powerhouse team in Rio Claro Brazil which was led by BJJ standouts, the Mendes Bros. At Atos Hamilton, we are fortunate to work closely with Professor Andre Galvao, as well as our Professors Rafael and Guilherme Mendes, who are all known worldwide to have completely changed the game of BJJ by dominating their divisions putting their style to the test and displaying its complete effectiveness. 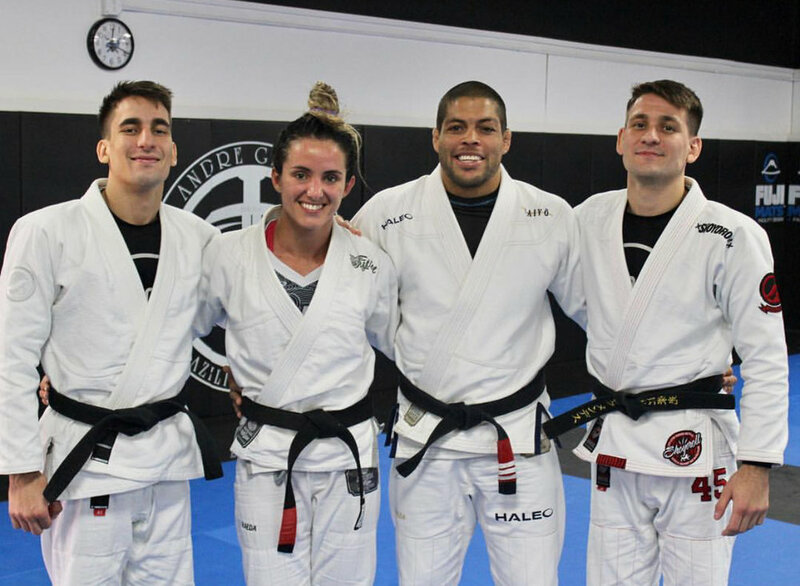 These three champions have revolutionized the way the BJJ world trains, competes and practices Jiu-Jitsu. They have not only changed and evolved techniques, drilling styles, they have also created a much more professional environment for those to train, which we emulate here at Atos Jiu-Jitsu Hamilton. As a team, Atos took 3rd place at the team title at the Worlds in 2015, 2nd in 2016 and Atos won its first team title in 2017. They have continued their success and recently won the 2018 Pans team title and are looking to repeat as champions at the 2018 World Championships in June. Atos has also won the kids title 6 years in a row at the IBJJF Pan Kids tournament (the biggest kids tournament in the world). Atos has academies in 14 different countries and we are really proud and fortunate to represent them here in Canada. In the next few weeks, we have a bunch of our members competing in Ontario’s biggest BJJ tournament, the Ontario Open. We have added a few more training classes to specifically focus on competition and I have been really happy to see the turnout in these classes, not only by those competing but by those who are not competing. Everyone is showing up and working hard as a team prepare for the upcoming tournament season!